WARNING: This medication must not be used during pregnancy. It may harm an unborn baby. In women of childbearing age, this medication should be started during their menstrual period. If not, then they should have a negative pregnancy test before starting this medication. It is important to prevent pregnancy while using this medication. Consult your doctor for more details and to discuss using at least 2 reliable forms of non-hormonal birth control (such as condoms, diaphragm with spermicide) while using this medication. If you become pregnant or think you may be pregnant, tell your doctor immediately. 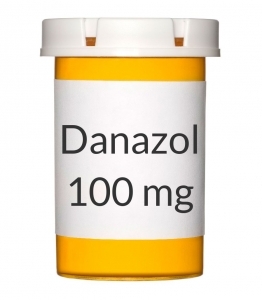 Danazol has rarely caused very serious (possibly fatal) blood clots (such as stroke), liver disease, and increased pressure on the brain (benign intracranial hypertension). Seek immediate medical attention if you have any symptoms of these side effects, including weakness on one side of the body, slurred speech, vision changes, severe stomach/abdominal pain, dark urine, persistent nausea/vomiting, yellowing eyes/skin, mental/mood changes (such as confusion), severe/persistent headache. USES: This medication is used in women to treat pelvic pain and infertility due to a certain uterus disorder (endometriosis) and also to treat breast pain/tenderness/nodules due to a certain breast condition (fibrocystic breast disease). It is also used in both men and women to prevent swelling of the abdomen/arms/legs/face/airway due to a certain congenital disease (hereditary angioedema). Danazol is an androgen similar to testosterone. For the treatment of endometriosis and fibrocystic breast disease, it works by decreasing the amount of hormones made by the ovaries. These hormones usually make the conditions worse. For the treatment of angioedema, danazol helps to increase the amount of a certain protein in your body's defense system (immune system). HOW TO USE: Take this medication by mouth, usually twice daily or as directed by your doctor. You may take this medication with or without food, but it is important to choose one way and take this medication the same way with every dose. The dosage is based on your medical condition and response to treatment. Use this medication regularly to get the most benefit from it. To help you remember, take it at the same times each day. Tell your doctor if your condition does not improve or if it worsens. SIDE EFFECTS: See also Warning section. Weight gain, acne, flushing, sweating, voice changes (hoarseness, change in pitch), abnormal growth of body hair (in women), vaginal dryness/irritation, or decreased breast size may occur. If any of these effects persist or worsen, tell your doctor or pharmacist promptly. Remember that your doctor has prescribed this medication because he or she has judged that the benefit to you is greater than the risk of side effects. Many people using this medication do not have serious side effects. Tell your doctor immediately if any of these unlikely but serious side effects occur: swelling hands/ankles/feet, menstrual changes (such as spotting, missed periods), mental/mood changes (such as nervousness, mood swings). A very serious allergic reaction to this drug is rare. However, seek immediate medical attention if you notice any symptoms of a serious allergic reaction, including: rash, itching/swelling (especially of the face/tongue/throat), severe dizziness, trouble breathing. This is not a complete list of possible side effects. If you notice other effects not listed above, contact your doctor or pharmacist. In the US - Call your doctor for medical advice about side effects. You may report side effects to FDA at 1-800-FDA-1088. In Canada - Call your doctor for medical advice about side effects. You may report side effects to Health Canada at 1-866-234-2345. PRECAUTIONS: Before taking danazol, tell your doctor or pharmacist if you are allergic to it; or if you have any other allergies. This product may contain inactive ingredients, which can cause allergic reactions or other problems. Talk to your pharmacist for more details. Before using this medication, tell your doctor or pharmacist your medical history, especially of: heart/blood vessel disease (such as coronary artery disease, stroke), high blood pressure (hypertension), diabetes, high cholesterol levels, breast cancer, liver disease, kidney disease, seizures, migraine headaches, unusual vaginal bleeding, certain blood disorders (porphyria, polycythemia), prostate cancer. Before having surgery, tell your doctor or dentist about all the products you use (including prescription drugs, nonprescription drugs, and herbal products). This medication may affect the sperm. Consult your doctor for more details. This medication must not be used during pregnancy. It may harm the unborn baby. If you become pregnant or think you may be pregnant, tell your doctor immediately. (See also Warning section.) It is unknown if this medication passes into breast milk. Because of the possible risk to the infant, breast-feeding while using this drug is not recommended. Consult your doctor before breast-feeding. DRUG INTERACTIONS: The effects of some drugs can change if you take other drugs or herbal products at the same time. This can increase your risk for serious side effects or may cause your medications not to work correctly. These drug interactions are possible, but do not always occur. Your doctor or pharmacist can often prevent or manage interactions by changing how you use your medications or by close monitoring. To help your doctor and pharmacist give you the best care, be sure to tell your doctor and pharmacist about all the products you use (including prescription drugs, nonprescription drugs, and herbal products) before starting treatment with this product. While using this product, do not start, stop, or change the dosage of any other medicines you are using without your doctor's approval. Some products that may interact with this drug include: "blood thinners" (such as warfarin), carbamazepine, certain "statin" cholesterol medications (lovastatin, simvastatin), cyclosporine, tacrolimus. This medication may interfere with certain laboratory tests (including blood levels of male hormones such as testosterone), possibly causing false test results. Make sure laboratory personnel and all your doctors know you use this drug. This document does not contain all possible drug interactions. Keep a list of all the products you use. Share this list with your doctor and pharmacist to lessen your risk for serious medication problems. OVERDOSE: If overdose is suspected, contact a local poison control center or emergency room immediately. US residents can call the US National Poison Hotline at 1-800-222-1222. Canada residents can call a provincial poison control center. Symptoms of overdose may include: yellowing eyes/skin, severe stomach/abdominal pain, dark urine. NOTES: Do not share this medication with others. Laboratory and/or medical tests (such as liver function, cholesterol levels) should be performed periodically to monitor your progress or check for side effects. Consult your doctor for more details. STORAGE: Store at room temperature between 59-86 degrees F (15-30 degrees C) away from light and moisture. Do not store in the bathroom. Keep all medications away from children and pets. Do not flush medications down the toilet or pour them into a drain unless instructed to do so. Properly discard this product when it is expired or no longer needed. Consult your pharmacist or local waste disposal company for more details about how to safely discard your product.